The P'Zone, Pizza Hut's take on a calzone, returns to the chain nationally in time for the NCAA March Madness basketball tournament. The P'Zone features a toasted parmesan pizza crust (a change from the previous version which was sprinkled with herbs and parmesan after baking) wrapped around a filling of pizza toppings and cheese and then baked. It comes with marinara sauce for dipping. The P'Zone comes in the same three varieties as before: Pepperoni, Meaty (pepperoni, ham, beef, pork, and Italian sausage), and Supremo (Italian sausage, green pepper, and red onion). 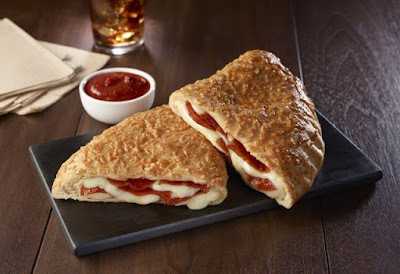 They're priced at $5.99 in my area but you can also get a Pepperoni P'Zone as part of the $5 Lineup value menu. If you're wondering how long the P'Zone will be sticking around, according to a Pizza Hut spokesperson: "The P’ZONE will remain on the menu until our fans tell us otherwise!"